I've really been in the mood to Konad lately... problem is, I'm horrible at coming up with good color combinations and design selections. I usually end up using one of the same plates I always use (m57 ftw!) and silver or gold chrome or holo for the stamp. I wanted to try something a little different this time, and, well... you'll see how it turned out. Despite the inconsistent star placement, somehow this hand turned out a lot better. But, still. Ugh. My first mistake was picking the Wine Red Konad special polish. In the bottle it looked so pretty and I expected to look more purple-ish when it was on the nail, but no... it didn't. It combined with the drab olive to form this sickly brown-red-blood disgustingness. I showed my friend and he said it looked like rotting camouflage. That actually sounded pretty cool to me, but I felt the need to cover up the mess a little, so hey, why not add some gold chrome stars! China Glaze 2030 is one of my go-to never fail Konad colors. That wine red Konad special polish must be pretty potent because it leeched into the gold after it had dried! You see that? Weird globby red spots in my gold stars! That, combined with the smudging of the lines from me pressing too hard combined to create a design that I imagine would be what it might look like if David Bowie were to take a crap on my nails. I still think it looks great! I have never been able to get the hand of konad-ing, so it's definitely nicer than anything I could ever do! XD And it does remind me of camouflage! Oo what is that base color? rofl omg you just gave me a horrible mental image of David Bowie droppin a deuce on someone's nails. Where oh where is my eye bleach!? However, I kind of like this design. 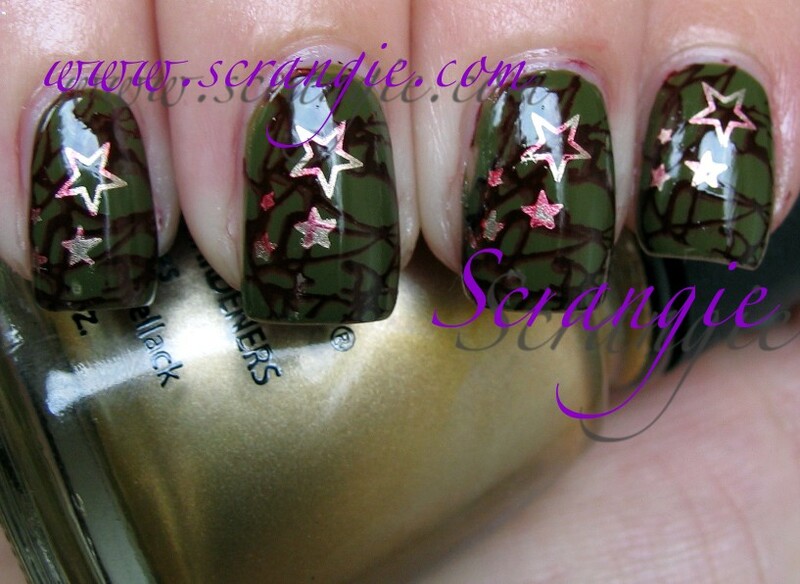 I totally think it looks like camo too. The wine red looks nice. I recently got the wine red from OCnailart,but when I got it,I thought it was black,and had to email Kathleen. She told me to look at the bottom of the bottle,because it's labeled "wine red". 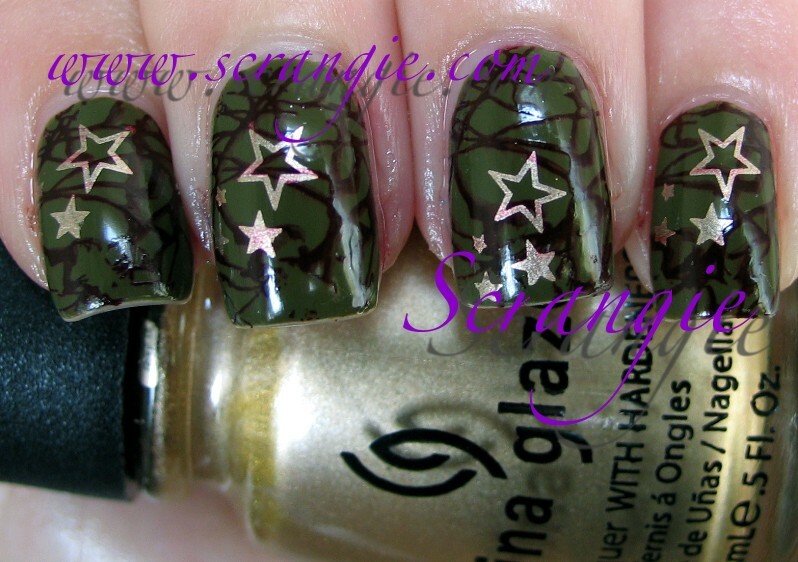 I actually like this, it looks kinda military-ish! I am the same way with stamping, though. I always ALWAYS use silver as my stamp color, for some reason. China Glaze Millennium is my go-to Konad color. I lack creativity! I actually think this looks good. It's tough and girly, and it has lots of personality. I'd take that over a boring sheer or French manicure any day! I thought it looked like camo too. That is until you likened it to Bowie Poop!!! LMAAAAO! I thought camouflage too when I saw it! Hey it's a 3 Star General Mani! Looks cool to me! I quite like it :) It inspires me. I don't know if you are familiar with "The Hungry Asian", she often adds konad to her mani. Very Nice. I love the stars, honestly. They're pretty. fail?! this is truly cute and awesome! It is an honor to have David Bowie crap on your nails! Haha, no, I think it's cute. I thought it was camouflage, too! I really like this! I would like it even better with Orly Luxe for the stars. I actually like this a lot. Hahaha at the David Bowie comment!